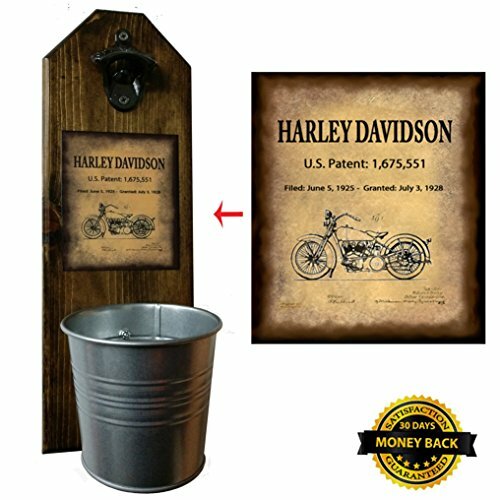 Harley Davidson Patent Bottle Opener and Cap Catcher - Handcrafted by a Vet - Made of Solid Pine - Rustic Cast Iron Bottle Opener and Sturdy Mini Galvanized Bucket - Great Dad Gift! Add the perfect finishing touch to your kitchen, patio, home bar, mancave, brewery, restaurant or tavern with our Handcrafted Harley Motorcycle Bottle Opener & Cap Catcher it's Over 15" Tall! This isn't one of those little namby pamby Bottle Openers! It's a decorative and functional item that will be appreciated on a daily basis. If you have any questions about this product by CherryPic Junction, contact us by completing and submitting the form below. If you are looking for a specif part number, please include it with your message.